Willie M. Napier, 91, of Oak Ridge, passed away Monday, November 26, 2018 at the Methodist Medical Center. She was born November 21, 1927 in Woodbury, Georgia, the daughter of William B. and Estelle McCrae Fowler. Mrs. Napier came to Oak Ridge in December 1952 from Atlanta, GA. She was a member of Kern Memorial United Methodist Church and a long-time volunteer at the Methodist Medical Center. 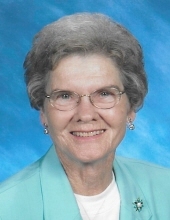 She had been active in bowling and bridge and in earlier years enjoyed playing softball and basketball. She was also a member of the Oak Ridge Woman’s Club. In addition to her parents, she was preceded in death by granddaughter, Cheryl Tims and brothers, Jim and William Fowler. She is survived by her husband of 66 years, John M. Napier; Son, Mark Napier and daughter, Judy Smith, both of Oak Ridge; 2 grandchildren, Meagan Miller and Danny McCool and 9 great-grandchildren. The family will receive friends on Thursday, November 29, 2018 from 12 – 2 pm at Kern Memorial United Methodist Church. The funeral will begin at 2 pm with Rev. Don Morris officiating. Interment will follow at Oak Ridge Memorial Park. Memorials can be made to Kern Memorial United Methodist Church, 451 E. Tennessee Avenue, Oak Ridge, TN 37830 or to a charity of the donor’s choice. Weatherford Mortuary is handling the arrangements. An on-line guest book can be signed at www.weatherfordmortuary.com. To send flowers or a remembrance gift to the family of Willie M. Napier, please visit our Tribute Store. Meet at the cemetery in the Masonic Garden. "Email Address" would like to share the life celebration of Willie M. Napier. Click on the "link" to go to share a favorite memory or leave a condolence message for the family.